Designer, inventor, entrepreneur; Charles Viancin is all of these things and more. Raised in the beautiful French Alps, Viancin’s creations have always had his passion for the natural world as their thematic heart. There’s no denying the unique and innovative feel of his kitchenware products – they’re the perfect way to bring some fresh ideas into your home. 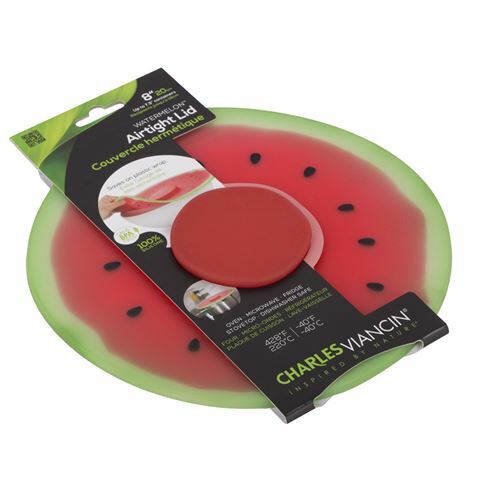 Take the Charles Viancin Small Watermelon Lid for example. It’s an incredible item, not only made from high quality silicon – making it the perfect airtight seal for smooth rimmed bowls – but also features a cute and quirky watermelon design. How can you resist? This item is sure to make your life in the kitchen easier, working as a saucepan lid as well as a food cover thanks to its heat resistance. Snap it up while you can. Made from food grade, BPA-free silicon. Heat-resistant from -40°C to 220°C. Creates an airtight seal on any round, smooth rimmed bowl or pot. You can even use it as a saucepan lid to retain steam during cooking. Reusable cover means no more wasting cling film or aluminium foil. Oven, microwave, stovetop and fridge safe.